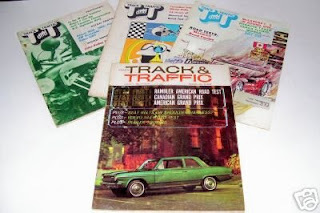 This blog reviews automotive history books and showcases the best of more than 1,000 published articles on collectable cars--complete with rare images and hard-to-find Canadian statistics--all by noted automotive historian James C. Mays. 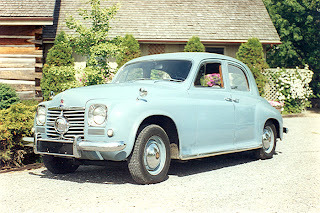 The 1966 Rover 2000 TC sold for $4,555 in Canada. The compact pocket rocket rode a 103.4-inch wheelbase. 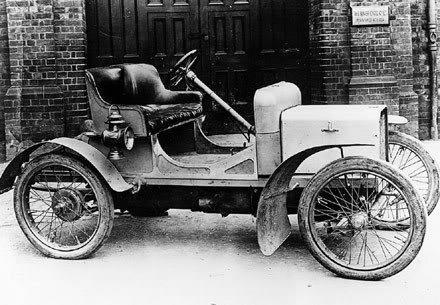 The first Rover hit the streets in 1904. Its use of cast aluminum made it highly advanced for its day. The British automaker's reliable product won the Tourist Trophy Race in 1907 and the company continued to blaze its own path to glory for decades to come. 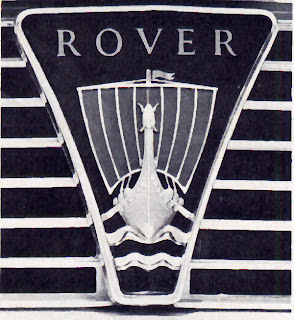 By the late 1920s Rover had established itself in the upper echelons of the British automotive industry’s pecking order. Canadians first met Rover during World War Two and it began to be sold here in appreciable numbers once the globe had returned to peace. from the United Kingdom to Canada. Under the hood lurked an innocent looking in-line, four-cylinder, overhead cam 2000-cc engine. The twin carb setup boosted horsepower appreciably from 100 to 124. The over square engine design yielded a bore and stroke of 3.375 inches. The crankshaft boasted five copper-lead bearings that gave longer life. All this might was mated to a four-speed, all-synchromesh manual gearbox. Now, this machine was no slouch on the asphalt. Acceleration from zero to 60 miles per hour (ancient Canadian units of measure) was accomplished in 11.45 seconds. Tests conducted by the crew at Canada Track & Traffic got it there in an even quicker 11.01 seconds. Official literature stated that the Rover could do a standing quarter mile in 18.5 seconds and hit 112 miles per hour as the maximum speed. Cruising at 90 mph was comfortable but it was noted that the tires whined--as did drivers when the police wrote out their speeding tickets. Gran Touring sedan in the traditional European tradition. As befitting a British luxury sedan, interiors were upholstered in prime quality English leather hides. Heavy pile carpets were fitted over thick felt underlays. Cabin colours were Biscuit, Grey, Black or Red. The washable headliner was available only in Light Grey or Biscuit but blended in with the trim colours. An oversize centre armrest in the rear, two glove boxes and a “trinket tray” for front passengers were among a myriad of thoughtful touches. Padded sun visors carried vanity mirrors. The instrument panel was straightforward in true racing style with controls located in the centre and a large, easy-to-read strip speedometer was positioned directly in front of the driver, with the tachometer to the right. For the Canadian market, body colours were offered in White and Blue Racing, Wedgwood Blue, Willow Green, City Grey, Zircon Blue, Arden Green and Venetian Red. Standard equipment was comprised of an Icelert—an electronic probe that alerted the driver to possible ice and slippery road conditions when the temperature hit +2C. There were bumper guards with rubber inserts, Pirelli Cinturato radial-ply tires, an outside rearview racing mirror, a tachometer, an aluminum spoked butyrate adjustable steering wheel, a wood gearshift knob, fully adjustable bucket seats, seat belt anchors fore and aft, windshield washers, an electric clock and a high efficiency heating system. The tool kit provided further evidence of Rover’s thoughtfulness to detail, the kit even included a tire pressure gauge. The optional equipment list for the Rover 2000 TC was short and sweet, but with a stiff upper lip it covered the essentials. 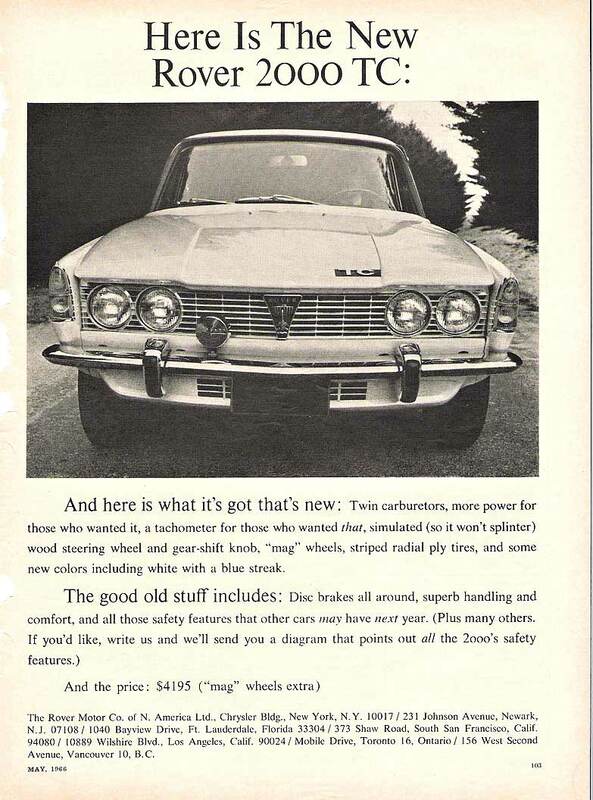 Included were concessions for Canadian tastes and preferences: air conditioning, tinted glass, a sunshine roof, radio, Magnum 500 or Mag Star wheels, a heated rear window, a roof rack and shoulder harnesses for rear passengers. 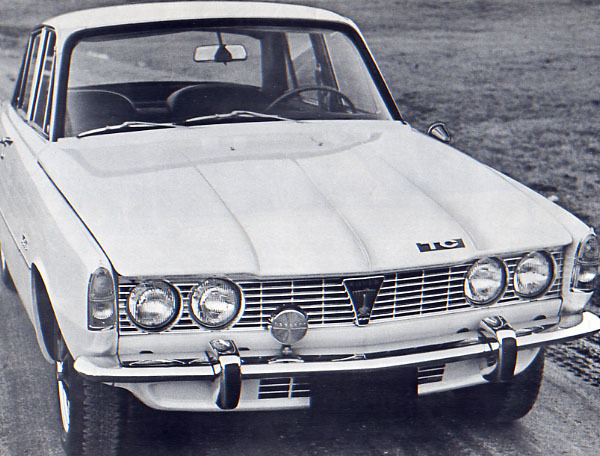 Rover Canada fielded three models for 1966: the 2000, the 2000 TC and the prestigious 3-litre Sedan that carried a list price of $6,295. 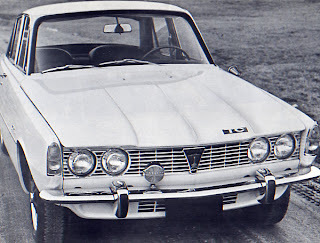 A customer could order a Rover here or arrange for delivery in the UK and bring it back as a used car at the end of a European holiday, thus saving duty and taxes. A tidy total of 555 Rovers were delivered domestically in the 1966 calendar year. Please share what you think about today's thoughts by posting a comment here. Website: The Oil Spot Eh!